Cerén, or Joya de Cerén, is the name of a village in El Salvador that was destroyed by a volcanic eruption. 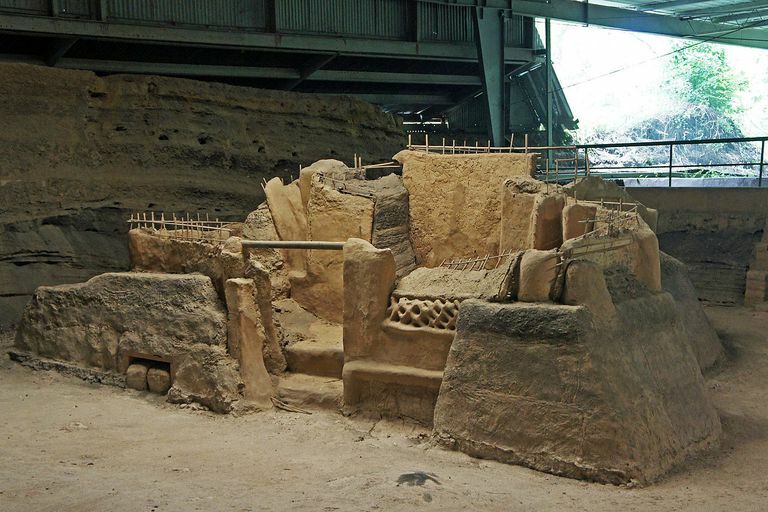 Known as the North American Pompeii, because of its level of preservation, Ceren offers a fascinating glimpse into what life was like 1400 years ago. Shortly after dinner started, one early evening in August about 595 AD, the Loma Caldera volcano of north-central El Salvador erupted, sending a fiery mass of ash and debris up to five meters thick for a distance of three kilometers. The inhabitants of the Classic period village now called Cerén, a mere 600 meters from the volcano's center, scattered, leaving dinner on the table, and their homes and fields to the obliterating blanket. For 1400 years, Cerén lay forgotten—until 1978, when a bulldozer inadvertently opened up a window into the perfectly preserved remains of this once thriving community. Although it is presently unclear how big the town was before it was destroyed, archaeological excavations conducted by the University of Colorado under the auspices of the El Salvadoran Ministry of Culture have revealed an astonishing amount of detail of the working lives of the people who lived at Cerén. Components of the village excavated so far include four households, one sweat bath, a civic building, a sanctuary, and agriculture fields. Negative impressions of agricultural crops, saved by the same flash-heat that preserved images at Pompeii and Herculaneum, included 8-16 row corn (Nal-Tel, to be exact), beans, squash, manioc, cotton, agave. Orchards of avocado, guava, cacao grew outside the doorways. Artifacts recovered from the site are just what archaeologists love to see; the everyday utilitarian wares that people used to cook in, to store food in, to drink chocolate from. The evidence for ceremonial and civic functions of the sweat bath, sanctuary, and feast hall is fascinating to read and think about. But really, the most spectacular thing about the site is the everyday normality of the people who lived there. For example, walk with me into one of the residential households at Cerén. Household 1, for instance, is a cluster of four buildings, a midden, and a garden. One of the buildings is a residence; two rooms made of wattle and daub construction with a thatched roof and adobe columns as roof supports at the corners. An interior room has a raised bench; two storage jars, one containing cotton fibers and seeds; a spindle whorl is close by, suggestive of a thread-spinning kit. One of the structures is a ramada—a low adobe platform with a roof but no walls—one is a storehouse, still filled with large storage jars, metates, incensarios, hammerstones and other tools of life. One of the structures is a kitchen; complete with shelves, and stocked with beans and other foods and domestic items; chile peppers hang from the rafters. While the people of Cerén are long gone and site long abandoned, the excellent inter-disciplinary research and scientific reporting by the excavators, coupled with computer-generated visuals on the website, make the archaeological site of Cerén an indelible image of life as it was lived 1400 years ago, before the volcano erupted. Sheets, Payson (editor). 2002. Before the Volcano Erupted. Before the Volcano Erupted: The Ancient Cerén Village in Central America. University of Texas Press, Austin. Sheets P, Dixon C, Guerra M, and Blanford A. 2011. Manioc cultivation at Ceren, El Salvador: Occasional kitchen garden plant or staple crop? Ancient Mesoamerica 22(01):1-11.